Seventh graders, start your engines! 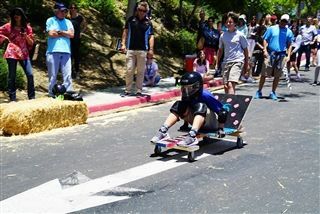 On June 1, the seventh-grade class raced derby carts they designed, prototyped, built and decorated in front of friends and family. There was even a surprise faculty entry by Mr. Richter, who dubbed his cart "Old Spice." The faculty entry was no match for the students, with "Kerchu" placing first in the derby! Afterwards, awards were given for best teamwork, most creative decorations and more.